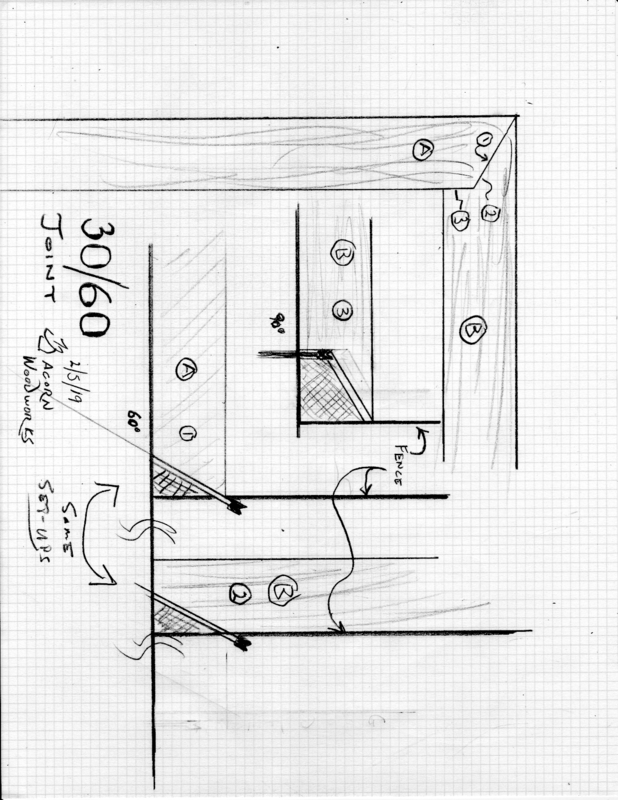 I need to make some square exterior tapered columns out of Teak. I want to use 1-3/4" thick material for durability and it looks like a custom cutter will be needed as I cannot find any lock miter cutters available. Has anyone been down this road or see any red flags ? I have not lock mitered such thick stock, but I have made corners like this and then I use a 60/30 joint. A custom cutter is a good idea. But with the Teak, it needs to be carbide. I've done this very thing in teak, by tilting a glue-joint cutter (Amana 61268, which has a 60mm cutter ht.) on my shaper. Can't remember if the stock was 1.75" or 1.625", but it did a great job. A quick CAD drawing shows that the 60mm ht. will cut a bit more than 1.625", but not a full 1.75", at 45 degrees. Also, I did a huge amount of teak for a house on the SC coast and used Kleiberit 501 PUR for all joinery and as far as I know it has held up well. We tried to put all joints together within an hour or so of milling, which from all the research I did seemed to the preferred method, rather than rubbing with solvents or the like, which some people thought was actually detrimental to the strength of the glue joint. The PUR gives a much cleaner joint than epoxy, and from all the adhesion tests we did had very little glue failure. I am planning to use Resorcinol Glue since it is still the best on earth and is now cleaned up with water. It is the only glue approved to make wooden airplane propellers in Europe. It has a good open time which allows for complicated assemblies. It does have a slightly visible glue line but that is what gives it the properties to resist UV. Thank you all for your input ! PUR is a moisture curing adhesive. Wiping down the wood with acetone or alcohol removes all of the moisture. Therefore the adhesive will take longer to cure as well as a possible inferior bond. Does a lock miter work on a tapered leg? Having trouble visualizing how that would work. Nope. This is why we used a modified "60/30" joint. One edge surface is 30 degrees and the other is 60 degrees. This provides a ledge to pull the two pieces together in a positive manner. For tapers, each surface gets backed down a bit depending upon the amount of taper. I don't understand what Dave is saying. Why not just use the angle? David, do you have a photo of how you do this " modified "60/30" joint"
Here is a section of the 30/60 joint in one inch material. All tablesaw, 3 passes, two on the same set-up. Hold material down and over for accuracy - Jointed materials and feeders or featherboards are required. A sacrificial fence is also needed so the blade can be run into it, past the joint cut. This will certainly work for wider material. Tight registry to fence and table are required, but that is true of the commercial cutters also. I learned this from an old German guy that made us unplug machines at the end of they so they would not use electricity to fill the cords. Just shows how we can be so good and so wrong, all at the same time!